This is a slightly different cut to the others, longer with a few extra scenes than most standard editions. As for the movie, this is a damn fine example of why Bruce Campbell is a b-movie star in his own league (erm.. B2?)... Great movie! Found it on and thought that some ppl here would be interested as well. All the credits go to Tombi999. Thx for sharing!!! The movie needs no explanation but this rip needs(?). This is the new MGM version from the Region 3 dvd. As Anchor Bay owns the rights in the USA, MGM owns the rights to the film in most foreign territories. MGM restored the director's cut using original film elements, unlike Anchor Bay which used video footage for some of the scenes. The picture in this new version is superb throughout. The Anchor Bay version got murky and VHS-like at times. All the scenes from the Anchor Bay Director's Cut disc are included here. Not only that, but it contains a short scene of Evil Ash ripping off Sheila's clothing, which was cut from the Anchor Bay version. So this is the most complete version available. 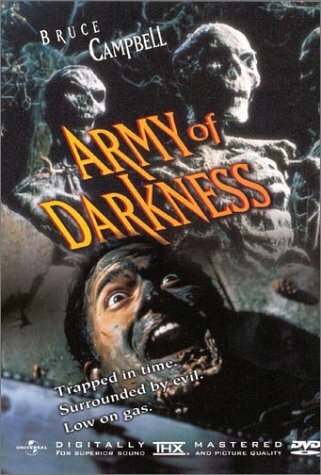 Enjoy this best version of Army Of Darkness!